Self-management has been highlighted as one of the most important treatment strategies for living with long-term neurological and chronic pain. As most chronic pain patients will pass through the primary care system as they seek treatment, it is vital that self-management advice and support is available to patients in primary care. The UK based charity Pain Concern, which supports and informs people with chronic pain and their carers, has conducted research projects to better understand how self-management is supported in primary care, and how this support can be improved in practice. The first project identified several barriers to supported self-management in primary care, from both a patient and healthcare professional perspective, and the second project piloted an intervention designed to overcome some of these barriers. 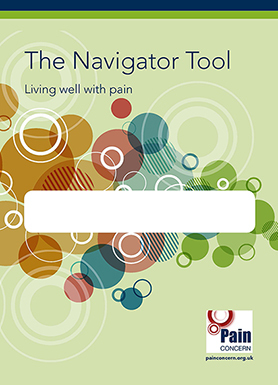 The Navigator Tool Intervention combines a training session for healthcare professionals to learn about how consultations can be made more self-management focused, and a paper-based tool for the patients to prepare with at home prior to the consultation. The aim is to make the consultation more effective because it is focused on concerns related to self-management. With the feedback gained from the pilot study, we are aiming to establish a sustainable project that launches the intervention in a way that will allow it to grow naturally in the future. We will establish a base of trainers that will be able to train new healthcare professional participants as well as new trainers. We are also aiming to launch a university-led evaluation study of the intervention to gather further feedback on how it is best adapted in practice, for which separate funding will be sought.